Home > Scientist Of The Past Who Shaped Our Present And Future > Newton’s Rediscovery of Gravity!! Meaning- The attracting (gravitational) force (is) the earth. That (earth) with that gravitational force of hers attracts towards herself the large objects in the sky. It seems as though she is falling. In space, with matching forces where will she (earth) fall. Meaning : Similarly, the deity that is earth exists by favouring, attracting, controlling by pulling down the vital function called Apana of the human. Else the body would fall due to its weight or would fly into the sky if left free. The first Shloka by Bhaskarah clearly talks about not only earth’s gravitation but of other heavenly bodies as well. The Second Shloka by Shankara says Apana. The functions of Apana are eating, drinking, digesting, urination, excretion, and Childbirth. It is proved that all these functions are carried out through the help of gravitational force. This Shloka clearly says that if the gravitational force was not present then the Apana functionalities cannot be carried out by the living beings and physical bodies would have floated everywhere. 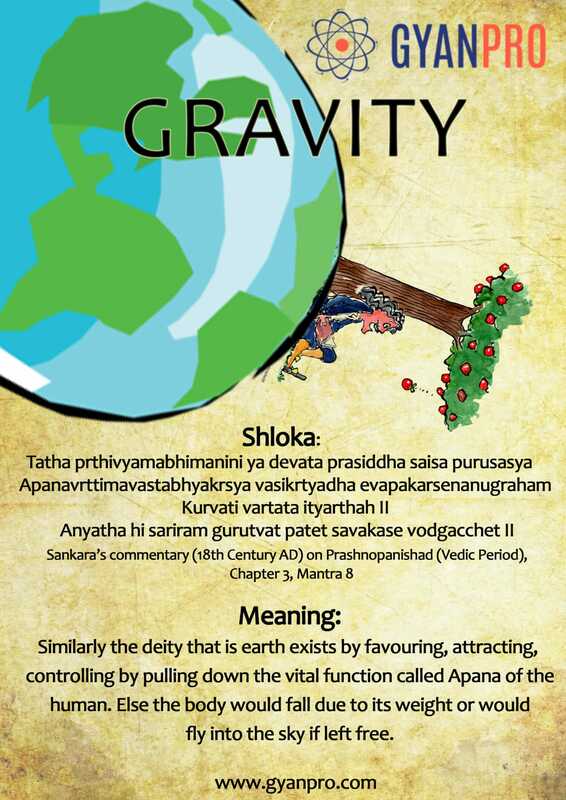 The Sanskrit term for gravity is ‘Gurutvakarshan’ (Guru-tva-akarshan). Guru=Big ; tva comes from tvam= you; Akarshana= attract, thus meaning of Gurutvakarshana= to be attracted by big. Even if we look further it explains that the bigger object have the high gravitational force which attracts the smaller object. About a hundred years before Brahmagupta, astronomer, Varahamihira had proposed the theory for the first time that there should be a force which might be keeping bodies stuck to the Earth, and also keeping heavenly bodies in their determined places. Hence, the existence of some attractive force that administers the falling of objects to the Earth and their remaining still after having once fallen; and also determines the positions which celestial bodies occupy. It was also recognized that this force is attractive force. The law of gravitation was proposed by Isaac Newton (1642-1727), 1000 hundred years after Bhaskara. Objects have been falling off the trees as long as the earth has existed, but he wasn’t the first to note it. Probably he was the first to record the theory of why things fall and why they fall at the certain speed. The popular theory of Gravitation is of Newton and apple falling off the tree and hit him on his head. But there might be little more to it than the story. Gravity is a natural phenomenon. Gravity on the earth varies from point to point and is affected by few things like mass, distance and placement. If the mass of the object is high the gravity pull is also high. The closer the object to earth the higher is the pull. Gravity is all around us, it holds everything, keeps our planet in its orbit. Fairly wonderful post. I simply found your site in addition to desired to point out that I actually enjoyed looking your blog discussions. In any case I am subscribing to your feed that i’m intending you are submitting one more time rapidly! Fairly wonderful post. I simply found your site in addition to desired to point out that I actually enjoyed looking your blog discussions. In any case I am subscribing to your feed that i’m intending you are submitting one more time rapidly!